A national day of action to protest against austerity will take place across the UK tomorrow, ahead of a large demonstration outside the Bank of England next month. The People’s Assembly, a coalition of trade unions, progressive groups and political parties is supporting organisations to arrange protests, public meetings and direct action in cities throughout the country, including London, Newcastle and Manchester. “After the last five years the British public has seen at first hand the effects of austerity – cuts in wages, cuts to essential services and debt-ridden families struggling to pay their bills. Since 2010, the UK government has cut public spending by around £35 billion. The ruling Conservative party - who won the elections earlier this month - plan to cut a further £55 billion by 2019 but critics have warned this will affect essential public services such as healthcare and children’s services. Penny Hicks, Convenor of the Manchester People’s Assembly told Equal Times their protests will focus on opposing the government’s privatisation of the NHS. 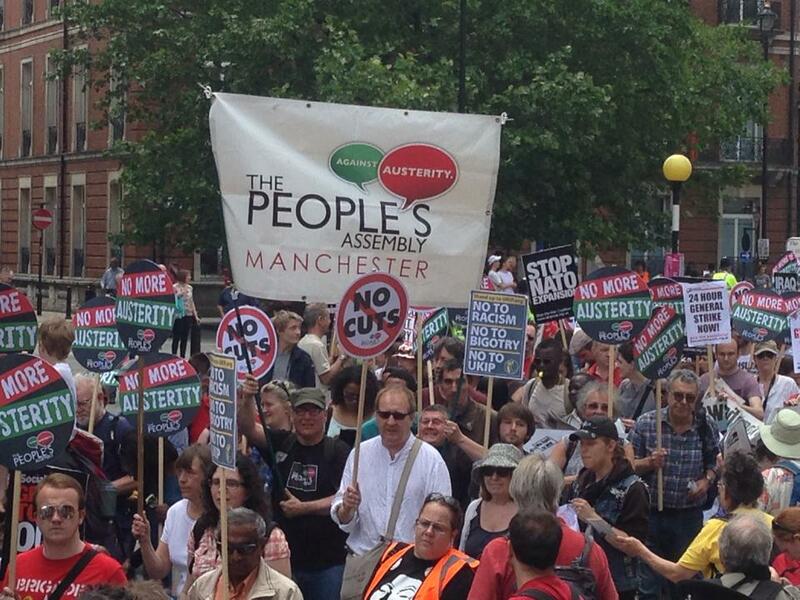 Since its official launch in 2013, the People’s Assembly has held regular demonstrations and events in an attempt to challenge the government’s austerity narrative and give a voice to those who oppose the cuts. “The reason that Britain has such a massive debt is because of the banking crisis and the mismanagement of the financial economy. The way of paying for this has been to cut back public spending meaning the most vulnerable in society have been giving the most towards paying back this debt,” says Hicks. “The critical thing about the People’s Assembly is it’s not a party political organisation. It brings together every interested group, union and campaign to make our voice known against the government. On June 20 the Assembly will host a large protest outside the Bank of England which they hope will be attended by hundreds of thousands of protestors. Over 60,000 people have already signed up to the event on Facebook. The Assembly’s anti-austerity message is supported by a number of leading economists, including Nobel Laureate Paul Krugman, who has been highly critical of the government’s fiscal policies. Last month, in the lead up to the general election, Krugman authored a long piece in the Guardian in which he accused the government of fooling the British people into thinking austerity was necessary.